One of the first galleries in the Giardini section of Christine Macel’s curated exhibition at the Biennale, “Viva Arte Viva,” is a skylit display of paintings by the African-American artist McArthur Binion. 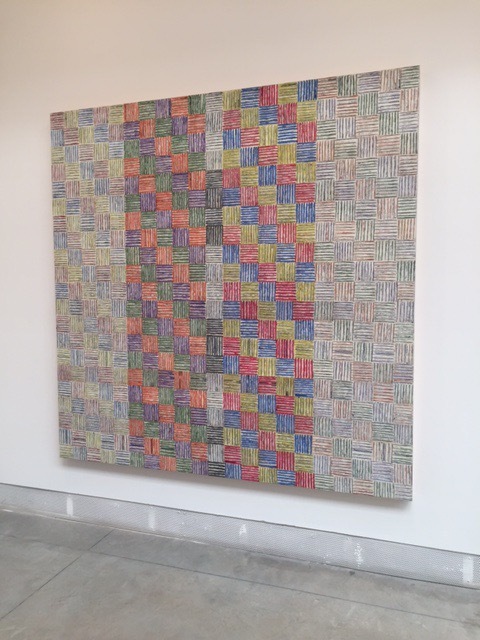 Completed between 2014 and 2016, this suite of works consists of abstract patterns painted on top of color copies of Binion’s birth certificate, and pages from the address book he kept from the 1970s to 1992, when he left New York to teach in Chicago. Standing in the gallery with his paintings today, Binion recalled his move to New York from Detroit in 1973, and evoked a SoHo era long past, though one that may be familiar to readers of Rachel Kushner’s excellent 2013 novel, The Flamethrowers. Binion, who was born to a blue-collar family, moved to the Big Apple with $95 in his pocket. His first friend was the artist Judy Pfaff. He recalled how SoHo artists would stop working at noon on Saturday, and go out and see each other, and see each other’s work, and he recalled how you could write a check for $15 at the Broome Street Bar.